Vile Regression return with a new line-up and new material this August in what is set to be a pretty intense night of metal loving mania. After losing both their singer (Danny Keogh) and guitarist (Keith Carroll) earlier this year, the band are looking to put themselves back on the map with this show, and they’re bringing help. Supporting on the night will be Dichotomy, AeSect, Visions Of Apophis plus one more band TBC. Admission is only €5 and it takes place on August 3rd (a Saturday so game on!). Vile Regression will be playing material from their debut EP (The Patter Evolves) plus new tunes from a forthcoming release (ohh). For more details, check out the band’s Facebook Event Page. If I have to write that one more time I’ll go insane. 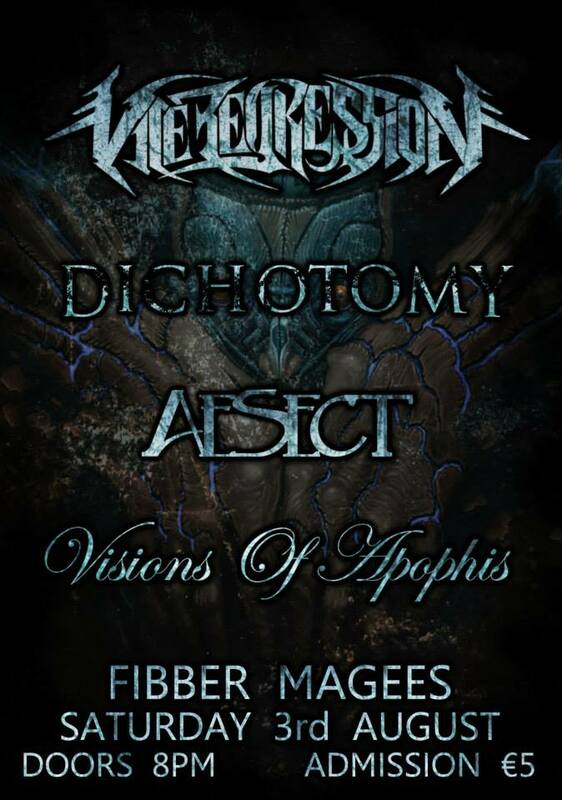 This entry was posted on June 13, 2013 at 2:27 pm and is filed under Gig Listing, Music with tags 2013, Aesect, Dichotomy, Fibber Magees, Vile Regression, Visions Of Apophis. You can follow any responses to this entry through the RSS 2.0 feed. You can leave a response, or trackback from your own site.